Sam's Tasty Art: A tribute. . .
. . .to my favorite faces on our local NBA team. I wanted to spend more time refining the likenesses, but I decided I'd better finish it quick since the Jazz aren't looking so great against the Lakers right now. 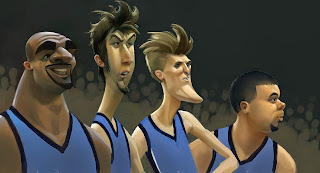 The players depicted here are (left to right) Carlos Boozer, Mehmet Okur, Andrei Kirilenko, and Deron Williams. I thought Deron's likeness would be easier to capture because he looks like a baby monkey, but he ended up being the hardest one---I'm still not happy with how he turned out. awesome sam. gotta love the Booze Brows. Not the most handsome bunch, are they. No wonder they felt the need to get Korver. Fantastic stylization of 'em! Especially that Okur fellow. These are great. I am liking the Mehmet Okur. Sam, this picture is awesome! Did you use acrylics? Funny, and nice color, my favorite is the second from the left . . .
Now they are looking a bit better against the Lakers (must be your art which inspired them). I love these, Sam. Kirilenko's chin is fabulous. Don't know who they are but they look awesome! Excellent likeness. Unfortunately they're out now. Nice job on these guys! Too bad they didn't beat L.A. Go Celtics! Absolutely love it. 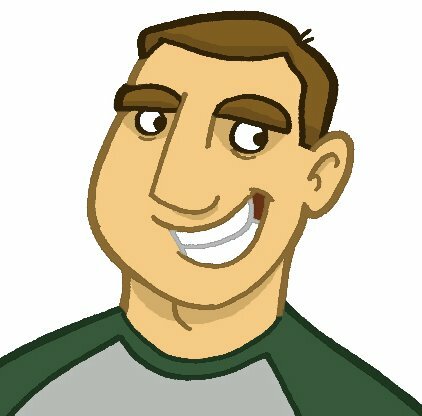 I think you nailed Deron perfectly (although Jerry Sloan is just begging to be caricatured!). Keep up the inspiring work. SWEET. That Carlos Boozer is hilarious!